This is most suited for carpark entries, workshops, small loading bays etc. where projection of the door cannot protrude past the building line, or where the door is to provide full clear opening height. 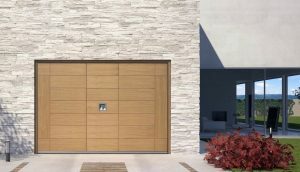 The door will be a counterweight balance, single leaf door lifting vertically up into a horizontal position behind the lintel, without projecting past the exterior building line. 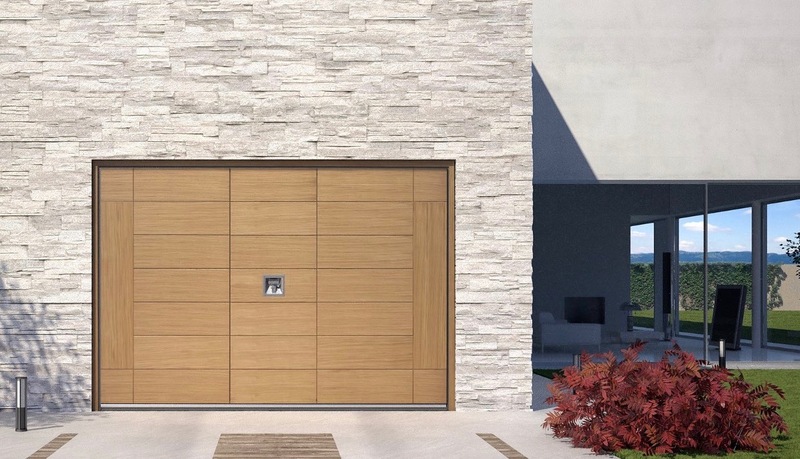 The internal glide-up door is a single leaf door, balanced with counterweights which are in constant suspension. The movement of the door is controlled by guide rollers in the horizontal and vertical guide channels. The internal lift up door, is available in manual operation to a height of 2700mm by 7000mm wide. Not suitable for high wind areas or should be motorised. Motorisation is available up to a size of 3000mm high by 20000mm wide. For sizes over these dimensions, please consult the manufacturer. Door can be either partly or fully glazed to provide light, give inspection windows or full showroom and retail display Standard glazing of door is 6.32 laminated safety glass set in high security aluminium double section glazing beads fixed to tubular frame. Glazing of doors are to Australian Standards and Specifications AS1288 PART 1-3, 1979. Heavier grades or ornamental glass should not be specified before consulting the manufacturer due to additional weight, deflection and door design involved. Fully glazed doors are fitted with a steel kick plate having a minimum height of 200mm as standard and increasing in height as a structure ember to avoid deflection in the closed position in accordance with door width. The doorframe's external face will be capped using aluminium glazed hat section to provide a shopfront faced finish. The door will be divided into window panels to meet door and architectural designs and to comply with Australian Standards. 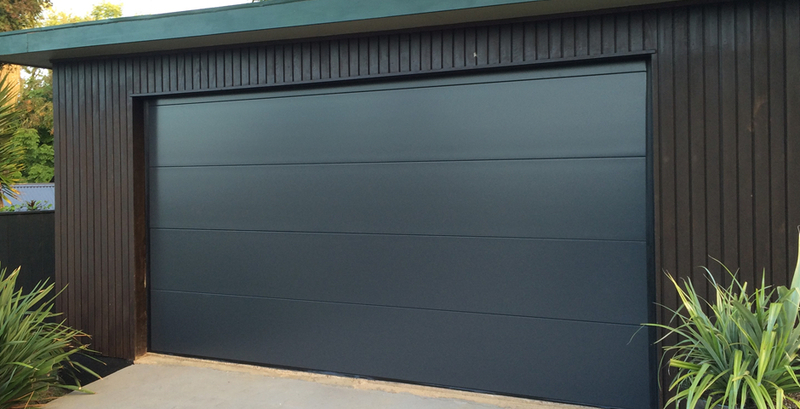 The panels may be infilled with glass (see glazed doors) or flat 2.5mm aluminium sheet. The aluminium will be finished in clear anodised as standard. Other colours are available where specified. 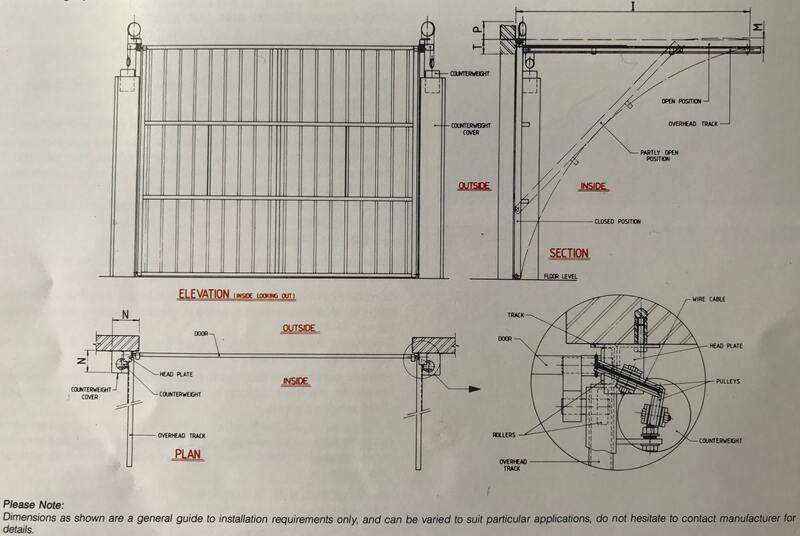 The Bar Grille will be constructed using 25mm square rolled hollow steel section tube welded to the door frame face vertically over the entire area at approximately 120mm spacings. The door will be prime coated using zinc chromate primer (or otherwise specified). Other finished that are available are plywood, woven wire, perforated sheet metal, alumply and flat galvanised sheet etc. Manual doors will be fitted with "T" handle locking at approximately 1400mm high connected to solid steel locking bars. The "T" handle locking key operated from outside only. Doors can be fitted with pad bolts internally, one fitted to each side. When door is motorised we recommend not to use locking due to self locking by motor. Operation is by a heavy duty diff and rack drive system driven by a 3 phase 415 volt or single phase 240 volt motor (single phase optional). The door will operate at 9 meters per minute. Remote control an optional extra.